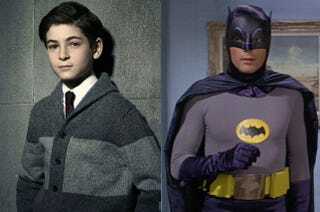 What If Gotham Is Actually A Prequel To the 1960s Batman TV Series? Watching Gotham continue its complete and utter lunacy in "Everyone Has a Cobblepot" last night, I was struck with a single, amazing thought. What if Gotham is an origin story not for regular Batman, but for the old Batman TV show from the '60s? Because the ridiculousness is reaching that level. Flass, the cop who murdered the witness a few episodes back, goes free thanks to Commissioner Loeb and the dirt he has on Bullock, which he uses to force Bullock to recant his testimony. (Loeb tapes Bullock's "confession" and even has it cued up for Gordon's inevitable arrival.) When Gordon asks why, Bullock reveals everyone in the department "has a Cobblepot" — someone they metaphorically or literally walked to the end of a pier and murdered. As commissioner, Loeb has forced his officers to force young officers to commit these crimes, so he has dirt on all of them. It's a simple but effective plan to maintain control. So Gordon decides he's going to find this group of blackmail files and destroy Loeb's leverage. After a completely unnecessary detour/gunfight at a Chinese bookie's hideout, Bullock batmans Loeb's old partner, who reveals that Loeb keeps his secrets with Falcone. Gordon is forced to make yet another deal with the penguin-y devil, and promises Cobblepot that he can have five minutes alone with the files if he can locate them. Oswald suggests a farm Falcone has once mentioned as "safe" — because why wouldn't it be the first location Cobblepot thinks of — and then it's time for a road trip! The farm is maintained by a kindly old couple who, it should go without saying, pull out guns and start firing once they realize Gordon and friends aren't working for Loeb or Falcone. Not only does Gotham pull the old "kindly old people as secret evil killers" trope, the woman is inexplicably dressed like she stepped off the Little House on the Prairie set, just for good measure. A silly gunfight ensues, and Bullock and Gordon head into the attic, where they don't find a pile of blackmail material. Instead, they discover Miriam Loeb, the Commissioner's crazy daughter, who killed her mother 20 years ago. Loeb's hidden her away, Jane Eyre-style, where she can murder starlings and make completely awful jewelry out of their bones in peace. When Gordon discovers Loeb's secret, he has no compunction about immediately using it to blackmail Loeb into retrying Flass for his crimes, backing Gordon's run as president of the police union, and giving up Bullock's file o' dirt. Actually, Gordon asks for the files of everyone on the GCPD, and Loeb says no, partially because Loeb doesn't want to be killed, and partially because Gordon is a pitiful negotiator. Gordon counts it as a good day's work, but Bullock reminds him that it rarely pays to do bad things for the greater good… of course, he's not talking about Gordon blackmailing Loeb with the fate of his mentally disturbed daughter, that's totally fine, but that favor he now owes the Penguin? That's going to come back to bite him. Hard. Maybe. It's Gotham. Who the hell knows? All I know is that both Gotham and Batman '66 are two completely silly series that make a token effort at appearing to take themselves seriously despite the ridiculous things that they show. I mean, I could see either TV show having the Penguin tell an elderly couple on the run only one of them can escape Gotham City, solely to watch the wife immediately betray her husband. The only difference between Batman '66 and Gotham is that in Batman '66, the wife would get caught by Chief O'Hara on the train out of town; in Gotham, the woman strangles her husband, and then Penguin shoots her anyways. Gotham returns on April 13th. See you then, same Gotham-time, same Gotham-channel. • Alfred doesn't die. Alfred refuses to rat out his friend Reggie to Gordon, even though Reggie stabbed him. Bruce vows to find Reggie, but makes no effort towards this goal. • Meanwhile in Crazy Town, not only has the mysterious Dr. Dulmacher arrived to meet with Fish, he's given her a brand new eye for… hell, I don't know. I guess Gotham didn't want to deal it. Fish partners with Dulmacher, which means when she gets back downstairs she immediately starts giving up people to be harvested, and the prisoners slowly realize perhaps they should have come up with a plan that involved a lot less willing sacrifice in it. • Speaking of Dulmacher, I'm completely bummed that the wonderfully creepy Jeffrey Combs played his middle manager instead of Dulmacher himself. Colm Foere is fine, but still, what a waste. On the other hand, it appears that Dulmacher turned Combs' character into a Frankenstein monster — including what appeared to be very large breasts — as punishment for his failure with Fish, so perhaps it's best that he gets to walk away and collect his paycheck. • In other insane costume decisions, Ms. Kringle is just outright wearing a 1950s bobbysoxer sweater. Because… IT'S A PREQUEL TO BATMAN '66. • Speaking of Kringle, the "Edward Nygma turns evil because he's rejected by a girl" continues lurching to its obvious, wretched destination. The fact that Gotham is spending this much time on a plot that trite and awful is absolutely the worst thing about this show. • Batman (verb): To scare someone, particularly with the threat of physical violence, in order to get information out of them.